Corporates have a huge advantage when it comes to commercialising innovation. Yet they are often outperformed and out-innovated by fast-moving startups. Brett Geoghegan, serial entrepreneur, veteran of Silicon Valley and startup advisor at BlueChilli illustrates how Product Managers can foster innovation, reduce brand risk, and leverage opportunities by thinking like a startup. The talk centred around insights from real-life projects Brett had personally been involved with, as well as observations from 16 years in the startup ecosystem. During the meetup Brett walked the cohort through his early days as an entrepreneur. The story sounded familiar to other stories of Australian entrepreneurs. He had a great idea and a will to succeed. So, off to San Francisco he went. The first idea he had crashed; the second one, well yeah it crashed also. But, the third startup had legs. Brett had learned from his earlier attempts and applied them to the third startup ith much better results. This doesn’t sound glamourous by any stretch of the imagination. But, then there are plenty of startup stories that have similar milestones. The interesting point Brett nicely encapsulated is that startups almost never succeed on the first go. That is OK. That is normal. With each attempt you learn more. It is true to say that with each attempt, even if you do fail, you become better at getting ideas off the ground. “An entrepreneur with multiple failed startups is much more bankable than an entrepreneur that is untested. Because, we have learned why we failed.” Brett Geoghegan, Startup Advisor BlueChilli. Getting ideas off the ground is really what startups are all about. Forget the cool ideas and anomalous standouts like Uber, Snapchat and WhatsApp. Entrepreneurship is the profession of forming ideas, testing them and pursuing that elusive product-market fit. It is a grind and it doesn’t always bear fruit. To be a startup is to uncover real needs, to create value and to sell the vision to stakeholders. It is a systematic process that requires discipline. It is an acceptance that many times you will test an idea and it will flop. But, you keep going?—?test and test and test and test and test….. Here is an interesting stat: there are approximately 1.3 million new startups around the world, each year. Think about it, if you know what you are getting yourself into then failure is just part of the gig. Each time you try something, you learn – you iterate – you improve. OK, so startups fail a lot. What has that got to do with Product Managers and corporate innovation? Corporates don’t like this kind of language, right? Sounds risky and expensive. As for Product Managers, well at Brainmates we think Product Managers are the key to innovating from within the organisation. But, we will get back to that later. Enter the concept of ‘small bets’. Startups rarely have many resources?—?comes with the territory. Corporates on the other hand, often have lots of resources. So, how can a startup ever succeed in an environment where there are huge corporates roaming? Well, because they don’t fear failure AND they know how to learn quickly and cheaply. It’s their ability to systematically learn quickly and cheaply that helps startups validate ideas and find product-market fit. So, why can’t corporates learn quickly and cheaply? The process of learning quickly is grounded in the concept of a Minimum Viable Product. We are not going to pull that apart here. But, it is the smallest investment you need to make to learn and to validate that a need exists and it is something you can solve. As soon as you learn something, build a little more, get it to a sample of your market and get feedback. Learn from this, iterate again. These are small bets. ‘Small bets’ is an acceptance that every decision we make has a degree of guess in it. The only way to truly know is to validate. The best way to do that is to get your solution (or part solution) into the hands of those that would trade value for it. i.e. Potential customers. If the value isn’t there for the market, and there is no way to pivot around it, then kill it off and move on to the next idea. You haven’t lost all of your chips. You only made a few small bets to learn that there was insufficient value created to motivate the market. Making small bets means you could afford to test numerous ideas. And, this is a key point that came from Brett’s message to the cohort in the room. If a business can accept the fact that not every idea will work, and to test product-market fit doesn’t need to consume all available resources, then you could try numerous ideas at a time. But more than that, Brett insists it is a must that corporates develop a funnel of small bets because we know most will not work. Only by systematically testing ideas in small increments will we learn quickly and cheaply to find those lucrative prospects. This is where there is a strong alignment in philosophies between Brainmates and BlueChilli. At Brainmates we empower product manager to drive innovation from within and deliver products that their customers love. Innovation is a continuous journey and really needs to be part of the cultural fabric of an organisation. Product Managers oversee the lifecycle of a product or product portfolio. As products enter a stage of decline there is a need to keep feeding new development to fuel the growth an organisation needs to achieve its objectives. A rapid, ‘small bets’ approach to sifting ideas for new development will empower a Product Manager to keep their organisation and customers supplied with a rich and ongoing supply of value in the market. This has to be a better way than the traditional corporate, big bet approach that doubles down on one idea and hopes it delivers the value everyone needs?—?when it eventually comes out. Can you think of a corporate big bet in recent times that didn’t pay off? Try Masters Home Improvement, owned by Woolworths. That is the perfect example of a corporate big bet. ‘We bet we can take on Bunnings with a similar proposition and share that lucrative pie’, I am sure someone said at Woolworths. That didn’t end up so well. After five years, Woolworths will sell off that failed bet, losing AUD$3 billion in the process. Was there another way? What if they decided to try a small bet approach? Perhaps roll out 3–4 stores initially, test the response from the market, before committing to more stores. Imagine what they would have learned much earlier in the process from those 3–4 stores. Unfortunately though, they went for a big bet and rolled out 63 stores in quick succession around the country. It will cost another AUD$500 million to wind up the Masters disaster. How does innovation happen in your organisation? Perhaps there is a bureaucratic business case process. A business case is designed to de-risk investments in innovation but generally end up killing most ideas at the start line. The ideas that get through often progress out of the sheer will power or through the political prowess of the owner. Unfortunately, neither of these traits bear any correlation to whether an idea warrants a big bet. An agile innovation process still looks to de-risk, but it does so by reducing the mountains of market research and analysis up front and shifts priorities into running tests in the market as quickly as possible. The learnings gained this way help support the subsequent commitments to resources. Open idea channels —don’t stifle innovation but limiting where ideas come from. Place lots of bets?—?the more ideas being validated the better. Most will not be viable. This little gem is the same resource Brett shares with all entrepreneurs he coaches and is used by the rest of BlueChilli around the country. It provides a simple formula to structure an idea into the right elements to uncover market need and test market value. The sequence of steps here is critical. Problem before solution; Market Opportunity before Business Model. Don’t skip any steps. You can read more detail around this framework by grabbing a copy of the presentation slides off Brett. 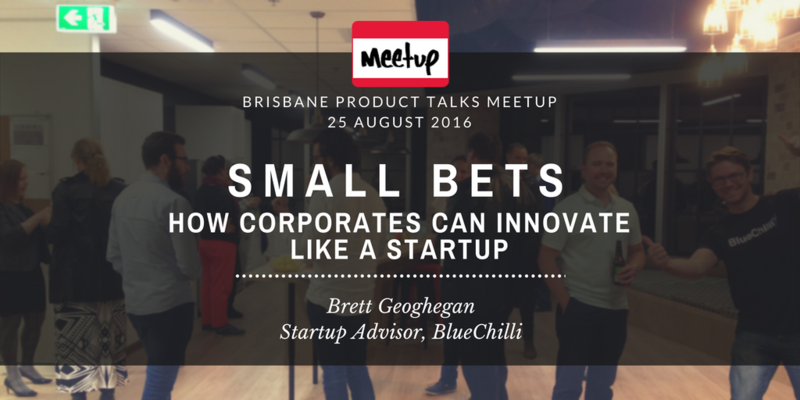 Brett Geoghegan is an Australian entrepreneur passionate about building world-changing technology products. Heading BlueChilli Brisbane, Brett has founded three startups?—?two in Silicon Valley, is a StartMate Alumni, Mentor at River City Labs and advises companies on product design in Australia and the US. Brett has also written software bought by a Silicon Valley tech company, and has been a keynote speaker and guest lecturer for organisations including NASA (Space Apps Challenge), QUT, and University of Queensland.